Back in 1910 the world’s first board track was opened at the Los Angeles Coliseum Motordome near Playa del Rey, California. Now, 100 years later, board track racers are again making a comeback to America’s west coast. 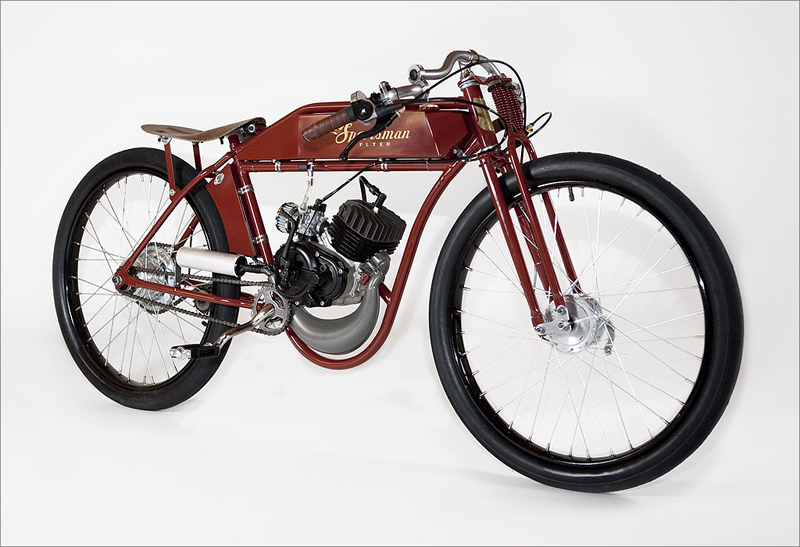 These stunning bikes are being hand-built in Gilroy, California by Pat Dolan who started the company out of passion for these classically styled motor bicycles. 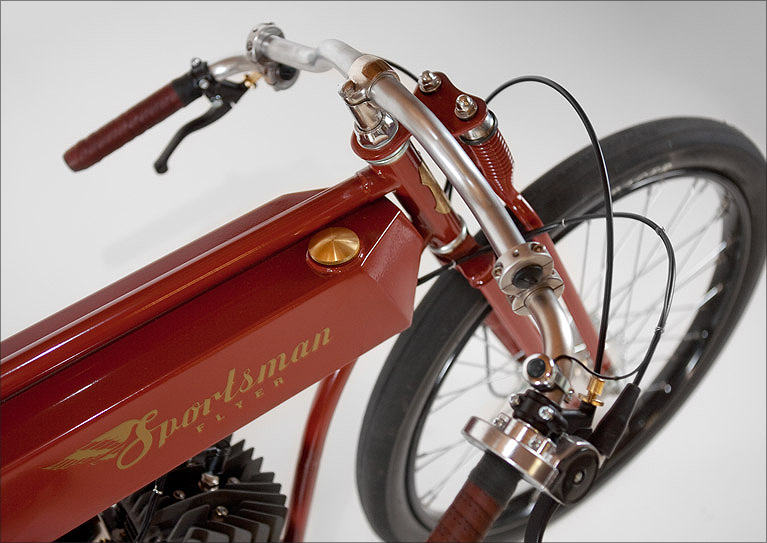 The “Sportsman Flyer Company” started not as a business, but as a hobby” he says. 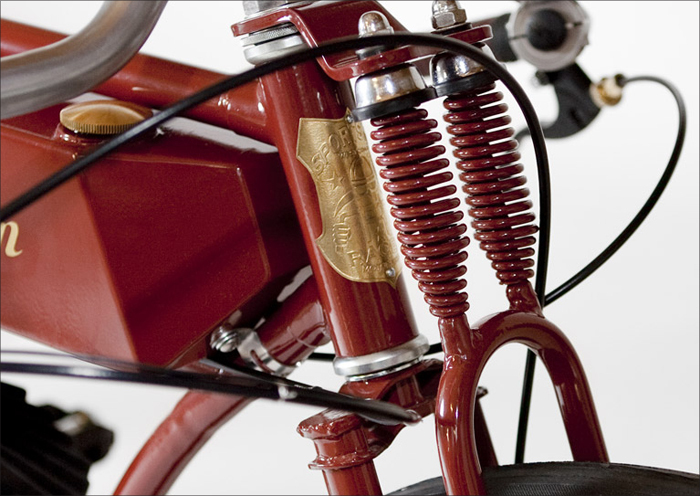 “I have built and collected cars and bicycles for years and have always wanted to add a Schwinn Whizzer motorized bicycle to my collection”. So while Pat was searching for the right bike, he started seeing motorized bicycles around the place with newer two stroke engines. 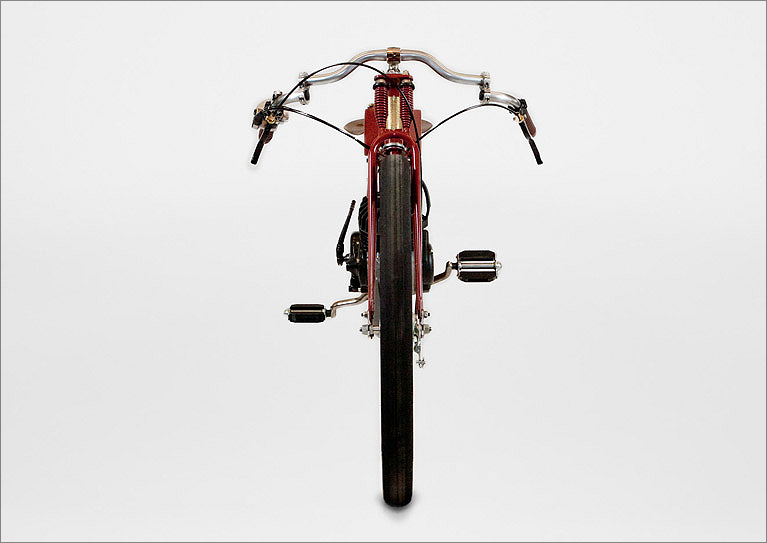 That’s when he decided to build one and started the project with a vintage Schwinn Panther frame. 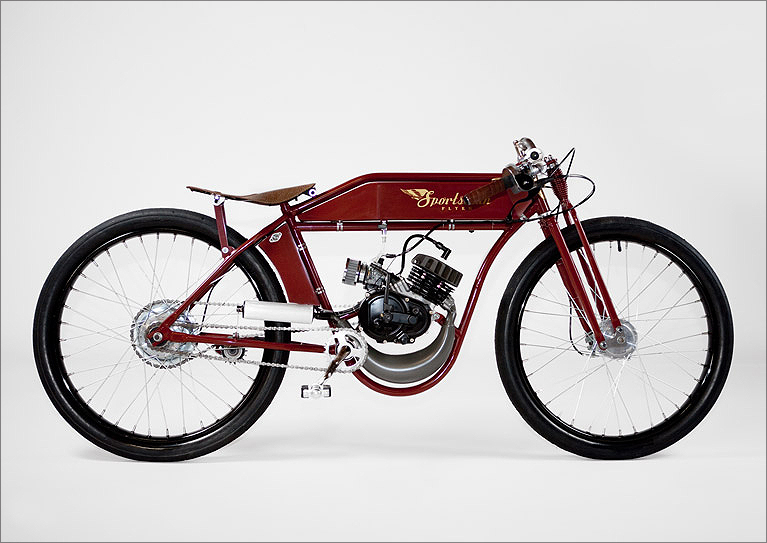 This red ‘Racer’ model is said to be “true to it’s namesake”. The chassis comes set-up to house the two-stroke single cylinder Morini S6S 50cc engine – which gives you around 9.4 horses of power. To quote the Sportsman website: ‘If you like the quick throttle response and durability of a modern two stroke engine, this is the model for you’. These esquisite little racers even come with a certificate of authenticity, serial number and record of the original owners name and build date. 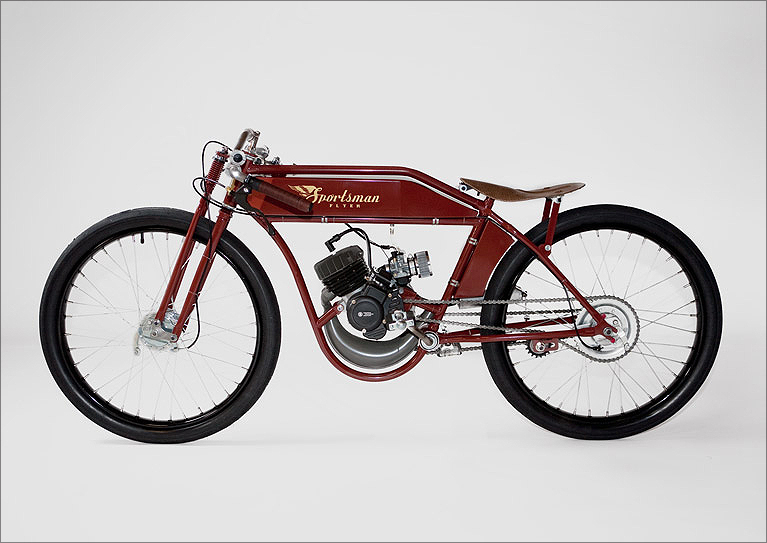 The kits also start at 1920’s prices (well almost) – for $1250 you receive a basic frame, fork and tank. 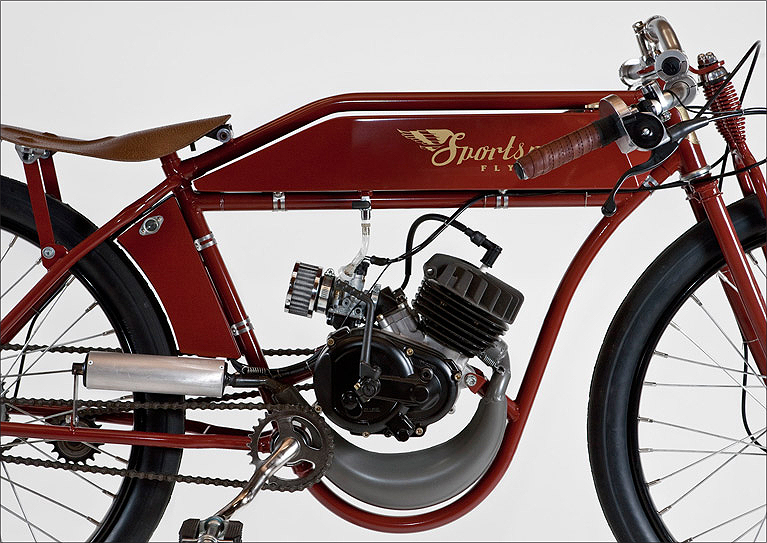 The Morini engine will set you back a bit extra; they usually retail for around $660. Then all you need to do is dust off that leather helmet, polish those aviator goggles and wax your moustache. Huzzah! Pipeburn Poll: Do Loud Pipes Really Save Lives?